Wine "Château MAUCOIL" - An historic property in Châteauneuf-du-Pape. The history of Château Maucoil began several centuries ago. 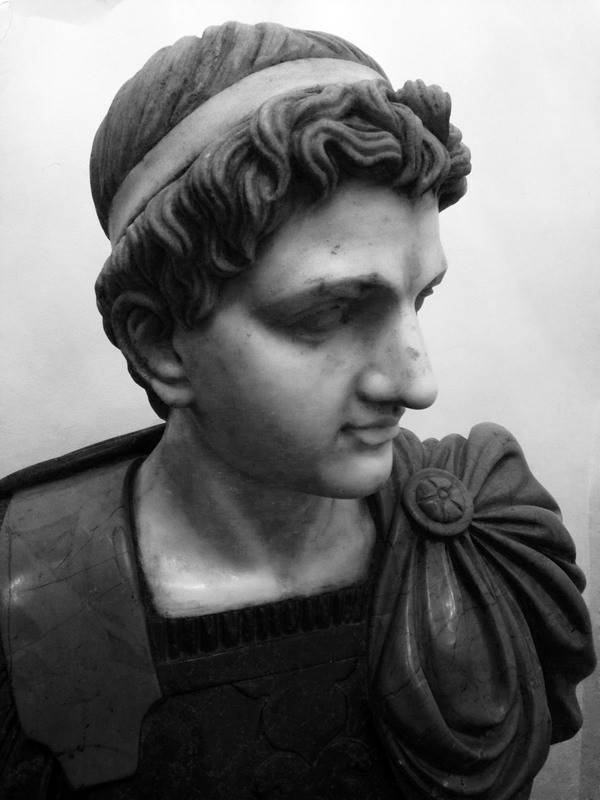 Ancient documents state that its first occupants were Romans and that they set up a base there for Caesar’s legions. 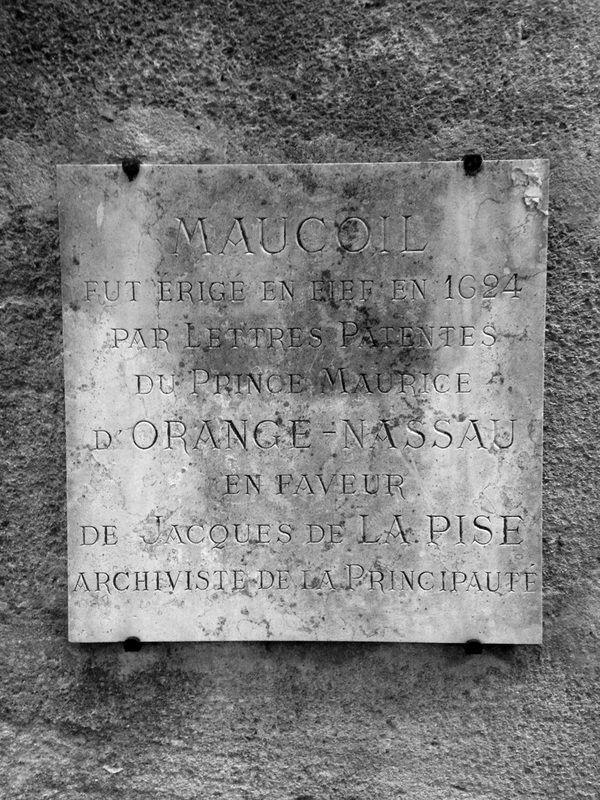 Later, Joseph de La Pise, Lord of Maucoil and archivist of the House of Orange-Nassau, the Dutch royal family, inherited the estate and the castle which was built in 1624. From then on, winegrowing became an intrinsic part of the history of Château Maucoil. A series of illustrious families successively took over the reins of the estate and helped to establish its reputation. 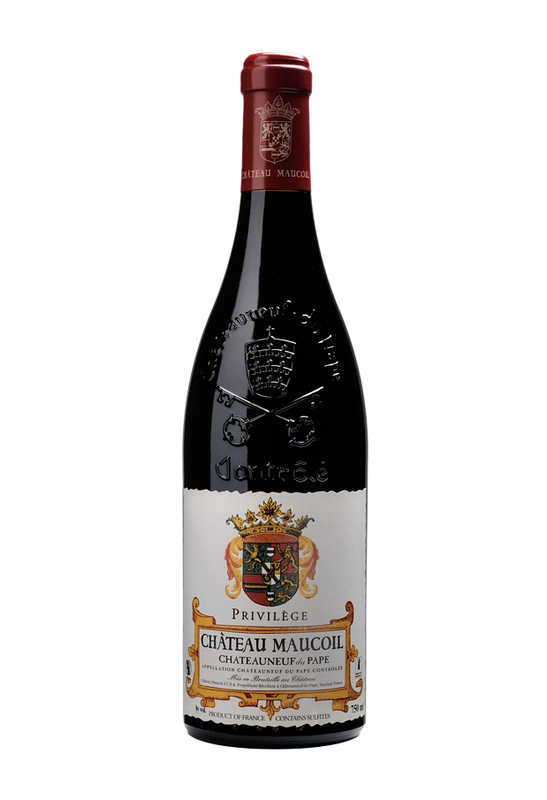 Already owners of another Château, the Arnaud family, several generations of whom were born and raised in Châteauneuf-du-Pape, decided to purchase the estate in 1995. Bénédicte, the youngest daughter of the Arnaud family, took charge of the Château with her husband Charles Bonnet in 2009. The 45 hectares of vines in the Châteauneuf-du-Pape appellation are tended in Organic agriculture since 2011. We are aware of the estate’s privileged situation and unique terroir, so we allow the vines to grow in pace with the care, precision and patience that we devote to them. We are attentive to the soil and work in the traditional way without using chemical weed killers. At Château Maucoil we prefer to use ancient methods such as furrowing, forming mounds and ploughing. We tend our vineyard with maximum respect for the people and the environment. Château Maucoil’s vineyards are located in the northwest of the Châteauneuf du Pape area, on the left bank of the River Rhône, and grow in the appellation’s three soil types: pebbles, Urgonian and sand. The vines for the white wine are planted in the Urgonian soil, a limestone terrain suited to their production. The yield is around 25 hl/ha and harvesting is carried out by hand, with the grapes being sorted individualy before vinification. After a 4-hour cold skin maceration and pressing, alcoholic fermentation is maintained at 18°C. Malolactic fermentation is prevented in order to preserve the wine’s freshness and acidity. All of the wine goes into barrels, on its lees, for 6 months, with a regular stirring up of the lees. Lovely light gold hue with green tints. 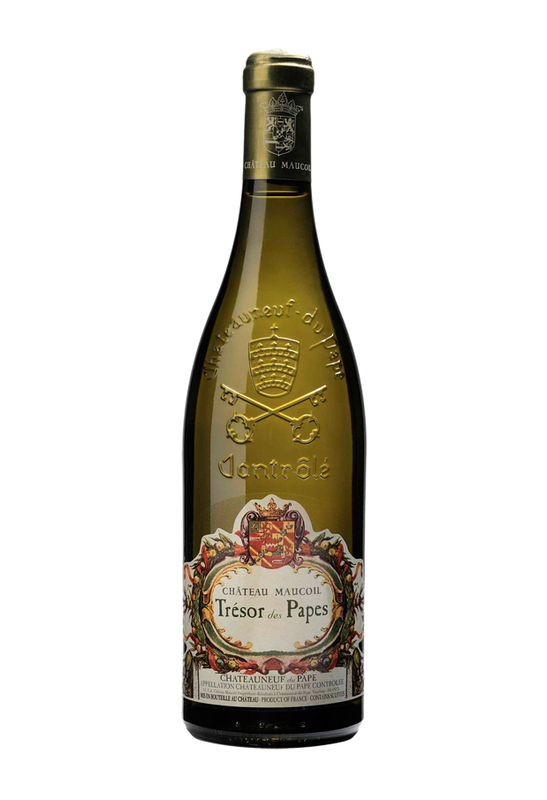 This wine is expressive with honeyed notes and aromas of yellow fruit and white flowers. On the palate, the wine displays a fresh frame, an exceptional velvety texture and superb length with aromas of dried fruit and nuts. This great classic from the domaine’s young vines growing in clay-limestone soil, possesses the special charm of the whites from the south, with concentration and freshness. Harvesting is carried out by hand in the early hours of the morning with the grapes transported in open 15 kg crates. The Grenaches and Clairettes are vinified separately in temperature-controlled stainless steel vats. Fermentation takes place gently, at a controlled temperature of 16°C. Malolactic fermentation is prevented in order to preserve the wine’s freshness, and the different varietals are blended just before bottling. Lovely golden yellow hue with brilliant tints. The bouquet is delicate, complex, floral, and slightly exotic. The wine is fresh on entry, and rich and fleshy on the mid-palate. The minerality carries on right through to the long fruity finish. 12-13° enjoy with a poultry “supreme”, cooked fish or cheeses made from cow’s milk. 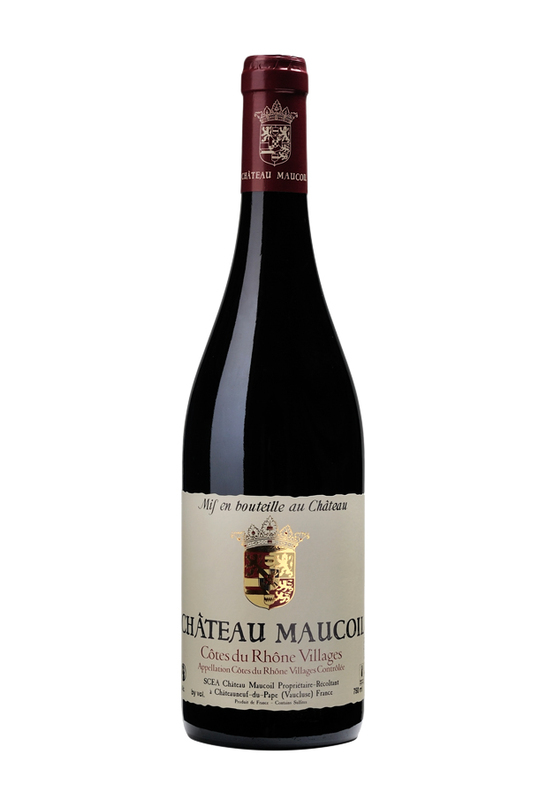 Its proximity to the Châteauneuf du Pape vineyards and the similarity of its soil (a mixture of sand and pebbles), as well as the old vines from which it hails, gives this Côtes du Rhône Villages great concentration and loads of character. Harvesting is carried out by hand and the grapes are transported in 15kg perforated crates. The grapes are sorted berry by berry before going into vat. By grape variety and by parcel. After a fermentation period of around 25 days with pumping over, rack-andreturn, and punching down operations, the wines are drawn off and then aged in vats until bottling. Strong ruby red hue. Aromatic and rich with black fruit on the nose (blackberry and plum) Good concentration, broad and solid with lovely length on the palate. 16-17°C, serve directly, ideally with grills or cow’s cheeses. Château Maucoil, a historical vineyard estate in Châteauneuf du Pape, converted to organic growing shortly after Benedicte and Charles Bonnet took over the domaine. This sulphur-free wine comes from old vines grown in a manner that respects both the environment and the grapes, resulting in the purest and most direct expression of its terroir. Its proximity to the Châteauneuf de Pape vineyards and the similarity of its soil, a mixture of sand and pebbles, as well as the old vines from which it hails, endow this Côtes du Rhône Villages with great concentration and loads of character. The grapes are harvested by hand and placed in 15 kg perforated crates. They are then individually sorted before going into vat. By grape variety and vineyard parcel. After around 10 days in vats (made inert by nitrogen to naturally protect the wine), and having undergone only pumping over and punching down operations, the wine is drawn off and bottled soon after its malolactic fermentation. Vinification is carried out without the addition sulphites. Lovely strong ruby hue. 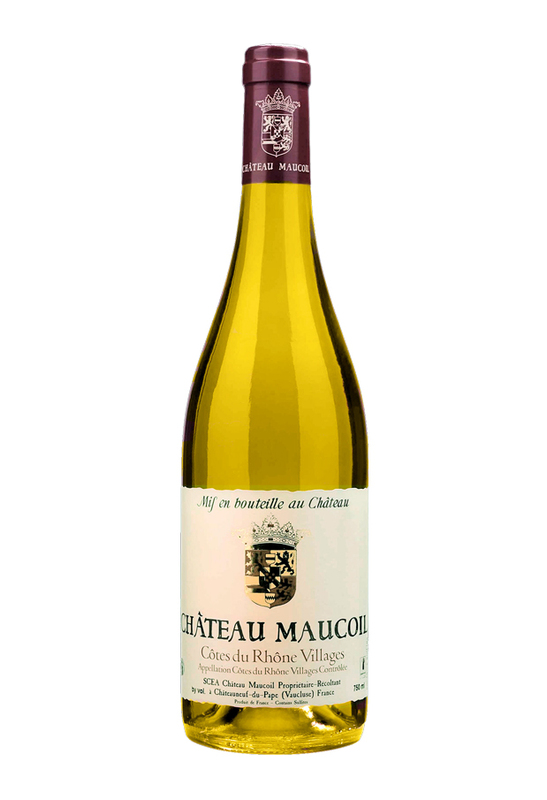 Fresh and aromatic on the nose with aniseed and red berry aromas. The wine is fresh and well-balanced on the palate and particularly pleasant in its youth. First reported case of Phylloxera in France was in 1865 and struck Châteauneuf du Pape in 1866. 2/3 of Châteauneuf du Pape vineyards were destroyed over the next ten years. Fortunately introduction of american rotstock, immune to Phylloxera enabled the vineyards to be restocked. Phylloxera gradually disappeared over the following years and our vineyard of Grenache was planted in 1895. The terroir of 1895 vineyard consists in a layer of marine molasse (sandstone) from the Miocène period covered with Alpine alluvium. The presence in the top soil of a large many round stones, known as galets, bears evidence of the time when the Rhône, then a torrent, tore fragments of rock from the Alps and deposited them along its course. Hand picked, sorted twice, Grenache varietal is destemmed before entering concrete tanks. Cold fermentation around 10°C (45°F) for seven days followed by three weeks of pumping over and delestages at 28°C (82°F). Native yeast is used for this very special cuvee. Beautiful bright ruby colour, elegant nose of black olive and red fruits, elegant tanins in the mouth. 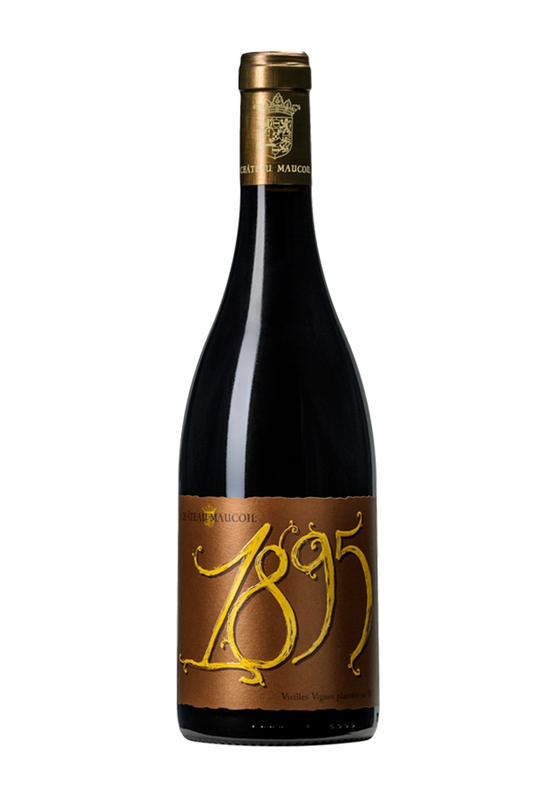 18 months in 360 liters French oak barrels from François frères, a very famous barrel producer. The vines for the white wine are planted in the Urgonian soil, a limestone terrain suited to their production. The yield is around 25 hl/ha and harvesting is carried out by hand, with the grapes being sorted before vinification. After a cold skin maceration and pressing, alcoholic fermentation is maintained at 18°C. Malolactic fermentation is prevented in order to preserve the wine’s freshness and acidity. The wine undergo fining and ageing takes place in vat to bring out the varietal aromas and natural volume of this whit fine wine. Lovely light gold hue with green tints. This wine is clean and bright. Rich and very fine on the nose with connotations of pear and citrus. This wine is elegant and dense with good persistency and lovely minerality. Enjoy as an aperitif with goat’s cheese canapés or paired with rich cuisine, shelfish, grilled salmon, brandade de morue (salted cod and potato mash), veal cutlets with chanterelle mushrooms. Château Maucoil’s vineyards are located in the northwest of the Châteauneuf du Pape area, on the left bank of the River Rhône, and on the appellation’s three soil types: pebbles, Urgonian and sand. From the Domaine’s youngest vines (40 years on average), planted with 4 grape varieties on sandy and pebbly soils. The yield is around 25 hl/ha and harvesting is carried out by hand, with the grappe individually sorted before vinification. The grapes are sorted and go into concrete tanks, by grape variety and by parcel. After around 30 days in vat, with pumping over, rack-andreturn and punching down, the wines undergo a mixed ageing, in vats and in barrels previously used for one vintage, before being blended. Strong ruby red hue with a beautiful shine. Very fine on the nose with superb black fruit and spicy notes. Delightful and intense on the palate, with lovely balance and great elegance, from the moment it is bottled. 16-17°C. Decanting is advisable if the wine is opened when young (under 5 years). Delicious with beef stew or casserole or mushroom risotto. Can be laid down for up to 10 years. This wine cornes from the Do­maine’s oldest vines (70 years on average), planted with Châteauneuf du Pape’s 13 grape varieties with a yield of around 15hl/ha. Harvesting is carried out by hand with bunches placed in 15 kg craies. The grapes are then individually sorted before going into vat. Grenache (50%) Syrah (15%) mourvèdre (12%), Cinsault (8%) Clairette and Bourboulenc (5%) etc. The grape varieties are vinified together. After a fermentation period of around 30 days, with pumping over, rack-and-return and punching down operations, the wines go inlo either 228L or 600 barrels (new or previously used for one vintage), depending on the plots they hail from, to be aged for a period of 12-18 months, depending on the vintage. The wines are then aged for several years in bottles before being released for sale. Strong ruby red hue with a powerful and extremely complex nose of fine spices, fruit, black olives and garrigue srubland. 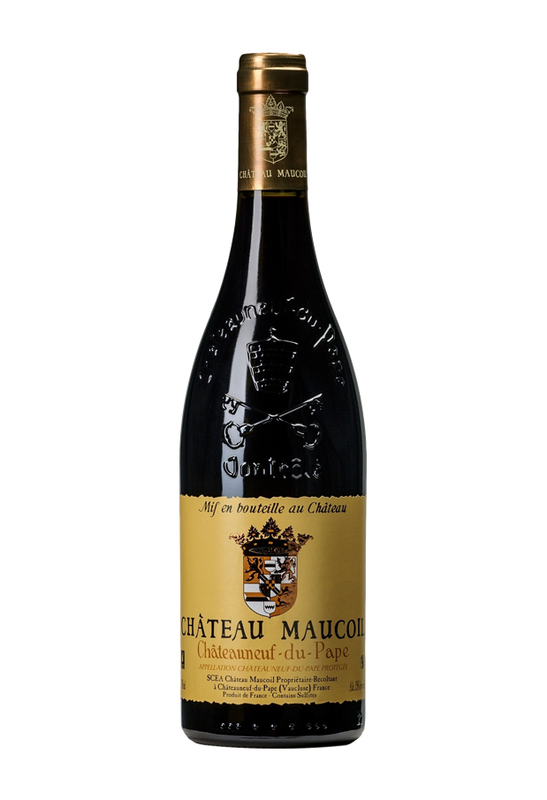 Concentrated on the pa­late, with nice polished tannins and exceptional length packed with spice and black fruit. Served between 17-18°C, this wine can be decanted one hour before serving to allow il to continue opening out in the glass over the course of the meal. If will pair nicely with meats served on festive or special occasions. Il con be laid down for around 15 years depending on the vintage. L’Esprit de Maucoil Is the result of a high-end selection and is only produced in exceptional years. 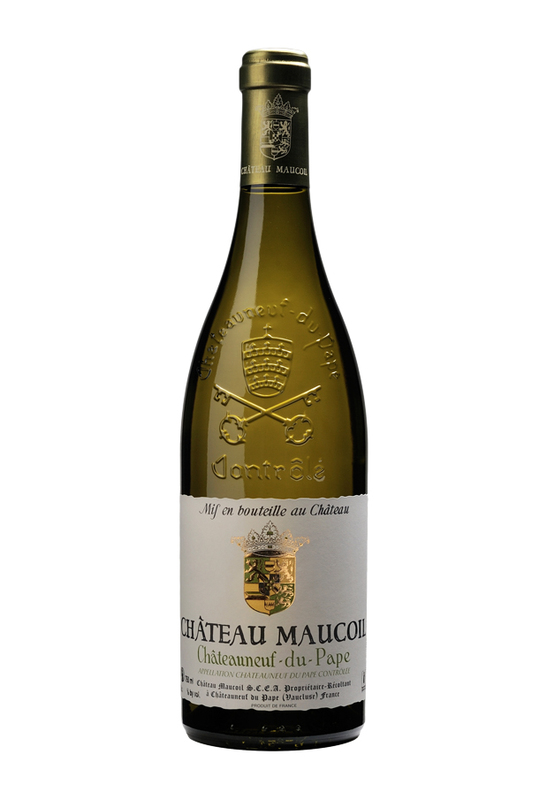 This wine comes from the Domaine’s oldest vines (70 years on average), planted with Châteauneuf du Pape’s 13 grape varieties with a yield of around 15 hl/ha. Harvesting is carried out by hand with the bunches placed in 15 kg crates. The grapes are then individually sorted before going into vat. The 13 Châteauneuf du Pape grape varieties : Grenache (50%) Syrah (15%) Mourvèdre (12%), Cinsault (8%) Clairette and Bourboulenc (5%), Vaccarèse, Muscardin, etc. Strong colour with garnet nuances. Deep on the nose,infused with Kirsch-like and jammy strawberry notes, highlighted by fine toasted notes accentuating its complexity. On the palate, aromas of black fruit and garrigue scrubland are elegantly underpinned by polished tannins and remarkable freshness. This is a wine with a great deal of breadth, an elegant, rich smoothness, and good development potential which will come out over time. 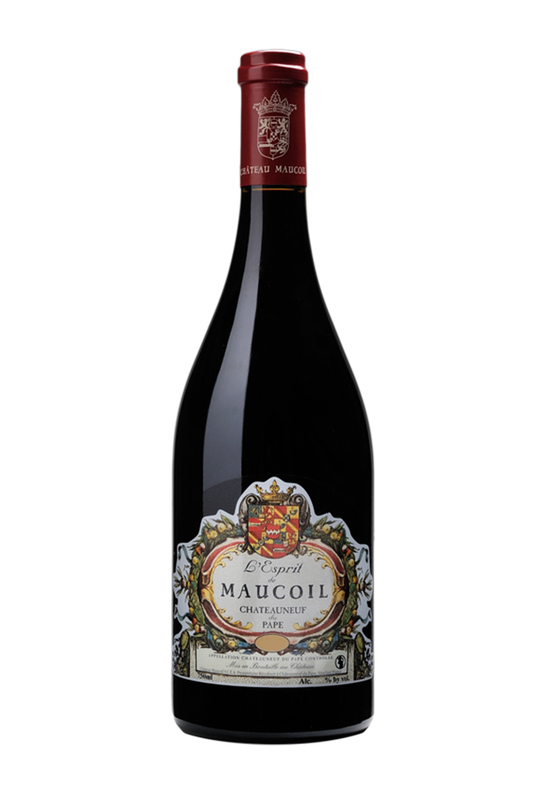 L’Esprit de Maucoil can be laid down for around 15 years, depending on the vintage. It should be brought out on special occasions and is perfect for connoisseurs who will appreciate it in all its splendour. It is best decanted and served between 17-18°C at a festive or celebration meal.